A beautifully-designed hardbound book containing personal stories by many of the original people who started the Iditarod Race, hundreds of historical photographs and full-color original paintings. Have you ever wondered what goes on before Iditarod teams take off from 4th Avenue in Anchorage? Don Bowers faithfully shows the joy and work and heartbreak and intensity of learning how to drive dogs, culminating in an incredible journey to Nome in the 1,100-mile Iditarod Sled Dog Race. Joe Redington Sr. was an ordinary man with extraordinary dreams and buckets of determination! His vision was as vast as the majestic Alaska landscape he loved to explore. This firsthand account is of the man whose love for the Alaskan husky and the Iditarod Trail evolved into the Iditarod Trail Sled Dog Race. Joe's adventurous spirit, fierce perseverance, and creative heart burned strong within his character and enabled the impossible to become a reality. The story of Joe's life from before he went to Alaska to his death in l999. It is a moving story of determination on Joe's part and paints the picture of sprint and distance racing in Alaska. This captivating book gives new insight into the intensity and struggle of both human and canine participants of what has been called the Last Great Race on Earth. Father and son chronicle the adventures with their dogs from training camp in Michigan to the Iditarod Trail in Alaska. One of the best-selling books on "the Big Trail." Sherwonit recounts the history and past three decades of the Iditarod and looks forward to its promising future, while photographer Jeff Schultz provides thrilling new photos, from the arctic landscape to the competitors and the dogs they rely on. A must have for Iditarod enthusiasts, and classrooms across the nation that follow the progress of the mushers each March. A nostalgic look back at Jon's 25 years of Iditarod poster art. Beautifully illustrated, with stories by Jona Van Zyle about each of the posters. Twenty-year-old Scdoris, afflicted with a rare eye disorder that makes her 20-200 vision impervious to correction, recounts her journey to Alaska's famous sled dog race in this slow but straightforward memoir written with family friend Steber. Follows the quick progression of Lisa Frederic from innocent tourist - to volunteer - to musher - in the Iditarod Sled Dog Race. It also follows several puppies who grew up to become key members of the winning 2006 Iditarod champion team! Salem received the coveted Golden Harness Award for his outstanding performance in Jeff King's team. Follow Paul Ellering and his marvelous dogs as they attempt to make their dream of finishing the Last Great Race come true. A humorous story that will appeal to animal lovers, Iditarod fans, pro wrestling fans and anyone who wants to take a trip and never leave home. A complete guide for skijoring, canicross and bikejoring. Smart, attractive, well organized with lots of humor, illustrations, photos and excellent information on how to get started in skijoring, canicross or bikejoring. Lots of useful tips and suggestions mixed with sound knowledge of dog care, training and racing. If you're thinking of taking up skijoring, do yourself a favor and start here. 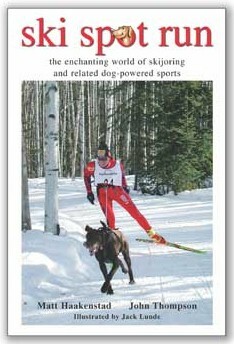 The definitive book on how to get started Skijoring--with YOUR dog! Covers equipment and training for different skijoring objectives (racing, recreational). A new edition of the classic "Skijor With Your Dog" with lots of new material (including a new section on dryland training). Extensive details on dog care and equipment. A must read if you're interested in learning more about skijoring or training your dog for a variety of dog powered sports. This is the only comprehensive book on sled dog veterinary medicine available and a must read for all involved in mushing. Topics covered include unique features of the racing sled dog, nutrition, general and orthopedic examination, specific diseases and traditional treatment, alternative treatment approaches, drugs and toxicities, practical tips and tricks for mushers and veterinarians on the trail, race organization and pathological findings. The year is 1908, and Anya and the gentle Chukchi sled dogs she has raised have been traded away from their native Siberia and set on a perilous course across the Bering Sea to the gold-rich territory of Alaska - landing them in a fight for survival they didn't start. Addressing family, work ethics, responsibility, and tolerance of others, this touching, yet action-packed story teaches valuable lessons we all must learn. Grade 3-7. An interesting, informative look at the Junior Iditarod Sled Dog Race, in which mushers between the ages of 14 and 17 compete in a two-day version of the race. A story about goal setting and finding your place in life. Advanced 2nd graders through remedial reading 6th graders will enjoy Foxy's Tale. Selected as one of the books for the 1997 Alaskan Statewide 3rd and 4th grade Battle of the Books. It was required reading for every 3rd and 4th grader in the State. Kimmick Come Home is a story of a young puppy who runs away because she thinks she is too funny-looking to be a famous sled dog like her Mom. But what can she be? Kimmick�s journey takes her on many adventures, from outrunning a moose to rescuing herself from a rushing river�all under the watchful eye of �Magpie,� a wise bird who encourages Kimmick to go back home where she belongs. What challenge did Miki, a young Alaskan husky face? Could she conquer it? What happened the first time Miki entered a sled dog race? Would she ever race again? A heavily illustrated, easy-to-read explanation of the Iditarod Sled-Dog Race. Jeanne was overjoyed when a white puppy was born at Glacier Ridge, her sled dog kennel. She had always wanted a white dog! Then she met Liz, who needed one . . . .
Deluxe hardcover edition, 8-1/2" X 11" features stunning photography of sled dogs, puppies, and winter scenes. Touching story for dog lovers young and young at heart. A wonderful story of a young deaf girl and her passion for sled dog racing. The sled dog information is as accurate as the emotional turmoil Kaitlin is going through after her mother's death compounded by fear of losing her father to emotional distance. Storm Run is the true story of Libby Riddles, who came north to Alaska to live with nature and, after battling a killer storm on Arctic ice, became the first woman to win the Iditarod Sled Dog Race. A compelling account, told in easy-to-read format, of Balto, a sled dog who led his team through snow and ice of northern Alaska wilderness to deliver medicine. Wiggle Waggle 1-2-3 is the BOARD BOOK version that counts from 1-12. Count with Alaska�s cutest sled dogs�in a toddler-friendly board book format! A team of frisky huskies introduce counting and parts of the body (noses, paws, ears) in this fun and educational board book. This adaptation pairs simple text with the visual excitement and doggy delight of original illustrations from Wiggle-Waggle Woof! Counting Sled Dogs in Alaska. Newton Marshal, an impoverished, illiterate Jamaican is the first black man in history to complete the international 1000-mile Yukon Quest, "the world's toughest race" and Alaska's Iditarod, "the last great race." The story of him accomplishing that unlikely achievement is about visionaries...who believe in challenging boundaries and stereotypes to overcome adversity and impact society. The Yukon Quest is more than just a sled dog race. It was the dream of two Fairbanksans recreational musher and an amateur historian who conceived of a race closer to the roots of Alaskan dog sledding. The Yukon Quest is a 1,000-mile slog through trails used only for this race that cross mountains, rivers, and lakes in some of the harshest weather on the planet. It celebrates the history of the dogs that carried freight and delivered mail, dogs that many times over saved lives before the advent of aviation and snowmachines made them obsolete. Can't find exactly the book you're looking for? Search the entire Amazon.com catalog by entering the author's name, book title or subject words in this Search Box! Just click on the "Search" button when you're ready to submit the search.